Covering over 150 acres of land and taking over 13,000,000 man hours to create, the Westfield London Shopping Centre is quite an accomplishment! 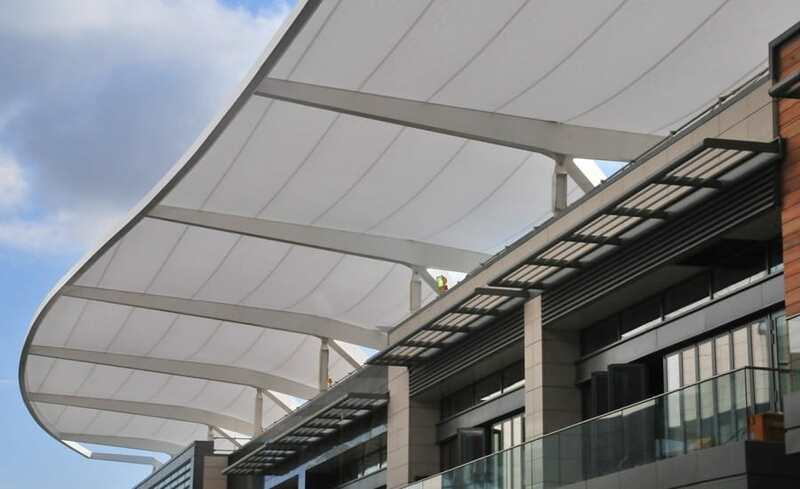 Working closely with the Westfield designers and construction professionals, Architen Landrell were contracted to create a 16 bay fabric canopy to cover and protect the Eat Street area of the new WSL white city project. 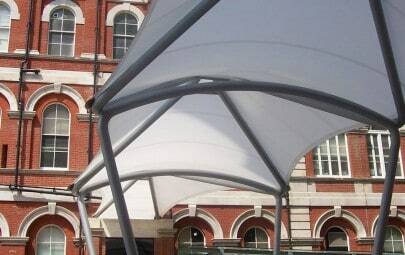 The area, which houses the main restaurants, cafes and bars on the site, is one of the busiest streets within the complex and therefore it was important to the designers to provide weather protection but also to keep the light and open air feeling. 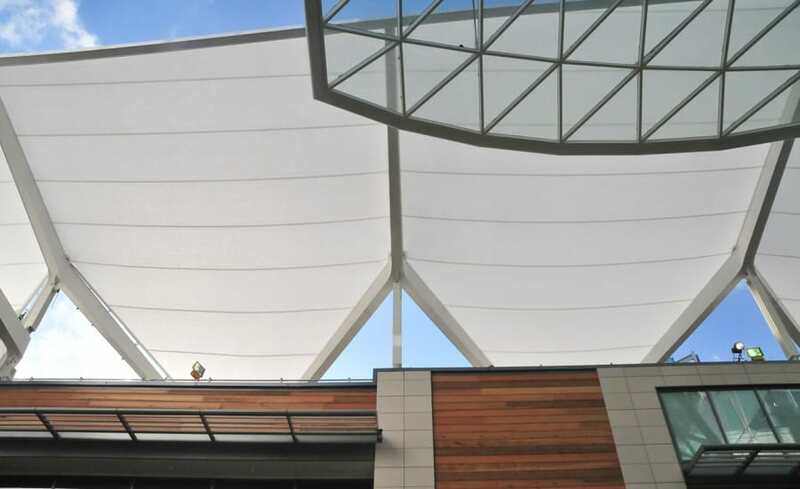 With Architen Landrells guidance, the team chose to use Gore Tenara, a PTFE based fabric which offers 30% or 40% light transmission, and at 160m long it is the largest Tenara structure in the UK! 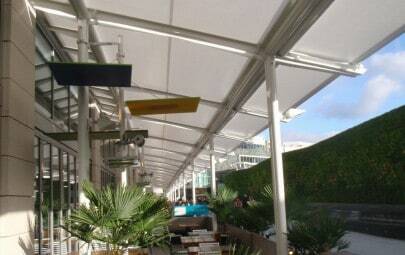 The canopy itself is split into three sections and is fixed three stories up, cantilevering off the main building. 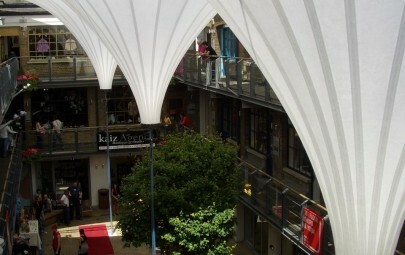 The original design had been one single undulating canopy running length of the street, however, it was found that the proposed clashed with the lower level canopies so the scheme had to be altered. 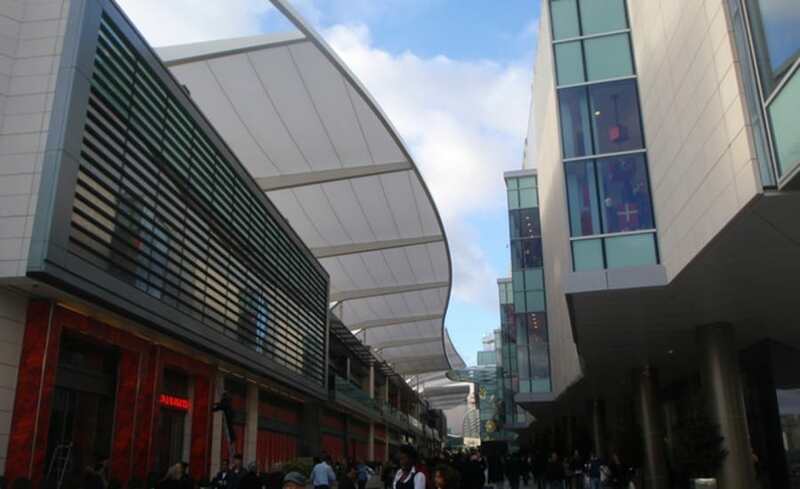 Due to the compressed programme towards the end of the Westfield 6 year build, the street became excessively busy with other contractors. As a result, we chose to perform the whole installation at night with multiple cranes and cherry pickers over a period of 2 months. Working nights also helped with access issues caused by the narrowness of the street itself. Cherry pickers and scissor lifts were adopted to take up minimal space but to speed up the installation process. The tight deadline was a real challenge for the team and required hard work, dedication and attentive project management. However, the work was completed and the shopping centre opened on time to the delight of all involved!